Growing up, I never really developed a sweet tooth. For my birthdays, I never ate my cake. I never got ice cream when we would go out for ice cream. I never stuffed myself full of candy at Halloween. Instead, I wanted carbs. Pasta, sandwiches, mashed potatoes, etc. Early conditioning into the addiction that is a high carb diet? I think so. At any rate, a few desserts did make the cut. Tiramisu, baklava, and most importantly, cheesecake. I can’t remember the exact year it all started, but my mom stopped buying traditional birthday cakes and started swapping out for cheesecake. Best. Mom. Ever. Though I don’t really crave sweet things on a keto diet, let alone non-keto diet, I can ALWAYS enjoy a nice slice of cheesecake. 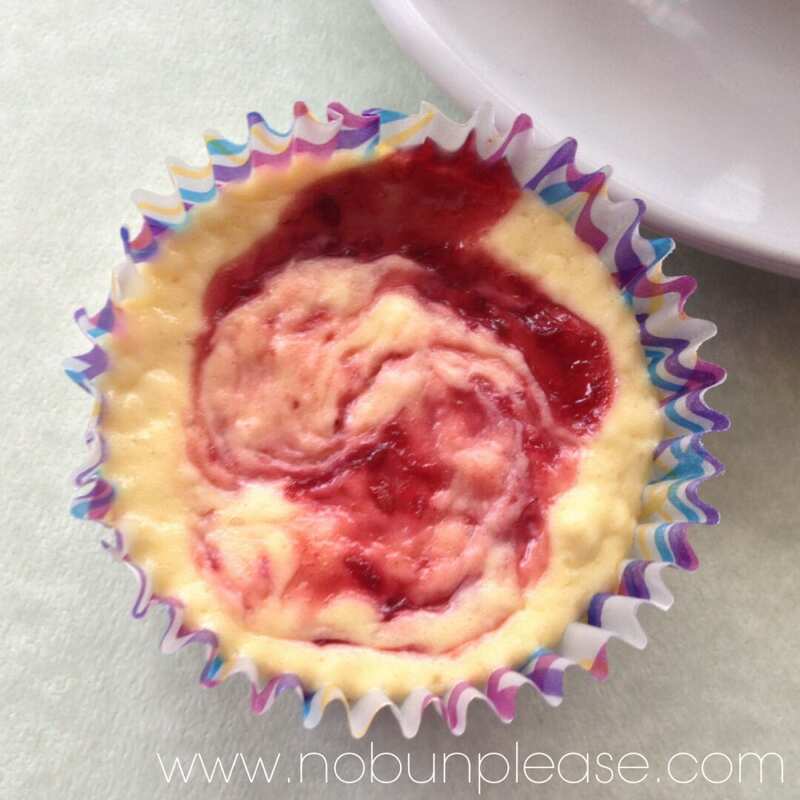 This low carb cheesecake is decadent, rich and swirled with slightly sweet yet tart raspberry jam. 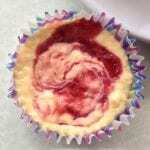 So there you have it, the delicious and less guilty low carb Raspberry Swirl Cheesecake! Suitable to have every day if you really wanted and if it fits your macros! The cooking method that this low carb cheesecake uses is to prevent the use of a water bath in the oven. It’s way too much un-needed work for such a small difference in texture. Add your favorite nut butter! Add peanut butter for a low carb version of Burger King’s Reese’s Pie! Macro/Nutrition: For 1* cheesecake, these come out to roughly 184 calories, 4 carbs, 3 NET carbs, 20 grams of fat, 1 grams of fiber and 6 grams of protein per serving! Mix together almond flour, melted butter and 1 tbsp of powdered erythritol until it forms a light, crumbly mixture. Equally spread out the mixture into the 12 cups of a cupcake pan. Make sure to use cupcake liners! Bake this mixture for 10 minutes. You will start noticing the fragrant almond aroma when they are nearly done. Be watchful of these, they can burn easily. After 10 minutes, remove from the oven and let cool. Immediately heat the oven to 400 degrees F.
Fill a lined cupcake pan with the mixture. These won't rise too much, so you can go relatively close to the top. Take a small spoonful of the melted raspberry preserves and drizzle on top of each individual cheesecake. If you want to make a more dramatic design, take a toothpick and swirl the red stripes! * IMPORTANT STEP* Put the cheesecakes in the oven and IMMEDIATELY turn the temperature down to 200 degrees F.
After roughly 40 minutes, these will be finished! They should be relatively spongy on top. Also, after they are removed from the oven, cool in the refrigerator for at least an hour before serving! What is your favorite dessert? Have you been able to find a good low carb substitute? Comment below!